For the construction of a luxury residential development beside the Dubai Water Canal in Dubai, German-Gulf Enterprises Ltd provided a total of 14 robust Chicago Pneumatic Stationary Generators. German-Gulf Enterprises, the authorized distributor of CP Generators has done a crucial part of a project for 6,000 new homes built by 2021. The order includes six CPSG300, five CPSG200, one CPSG105 and two CPSG60 stationary generators, equipped with Chicago Pneumatic’s BSE7320 control panel, which enables users to operate the machines remotely. CPSG stationary generators provide excellent accessibility and serviceability via large removable 45-degree doors. They are also installation-friendly, thanks to dual position (top and front) air outlets, and eco-friendly, as a result of a spillage-free frame design that provides for easy, clean drainage of all liquids. To facilitate faster positioning of the generators, both on and off-site, the contractor also requested that all the larger CPSG300 machines were equipped with an optional lifting beam. Additional features of the CPSG units include different levels of noise isolation, a lockable fuel filling cap, a robust terminal board that is suitable for connection with or without clamps, and easy fuel tank cleaning access to prevent damage from contaminants. Edmerlito Gonzales, the regional business line manager for Chicago Pneumatic Construction Equipment in the Middle East, says: “We congratulate German-Gulf on securing this significant order, which further increases recognition of our brand in the UAE. 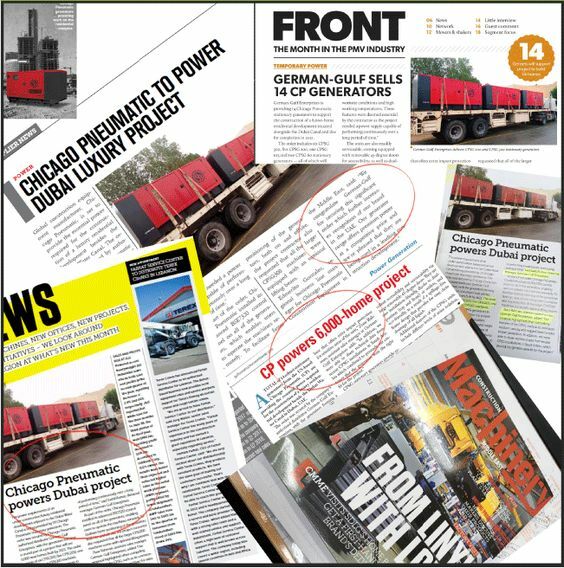 Our generator range offers premium power at a competitive price and leading construction development.” Chicago Pneumatic, established in 1901, offers a wide range of pneumatic, hydraulic and petrol-driven equipment, portable compressors and generators, light towers, rig-mounted attachments, and compaction equipment for the construction and demolition industry. With a global network of distributors, Chicago Pneumatic provides customers with worldwide sales and service support. Chicago Pneumatic, also known as “CP”, is an industrial manufacturer providing power tools, air compressors, generators, light towers and hydraulic equipment. Check out the Chicago Pneumatic – Showcasing the latest portable energy products and construction tools. German-Gulf offer Chicago Pneumatic Products!